Caviar has long been paired with potatoes in various forms, so this is my take on the classic combination for the seemingly-requisite caviar course on a fine-dining menu. True "caviar" comes from sturgeon and is preposterously expensive. 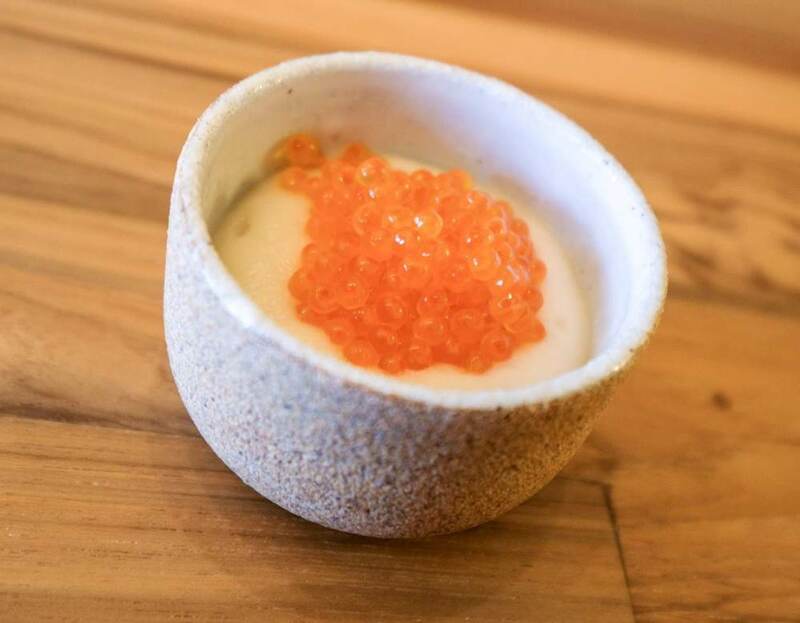 Fortunately for me, I find the slightly-larger and much-cheaper trout roe equally as delicious and maybe even a bit more interesting, as the globules pop a bit more noticeably with a nice briny salinity. Instead of potatoes, this dish is served with a mousseline (think incredibly smooth and light mashed potato texture) made from celery root aka celeriac that gets its light and airy texture from being put through a whipping siphon. Two unusual techniques on top of the whipping siphon contribute to the mousseline's flavor and texture. I don't have access to a smoker, but infusing hickory wood chips into the milk used to cook the celery root will add some of the flavor notes. Second is a technique from Modernist Cuisine in which diastatic malt powder, containing the enzyme diastase, is used to break down the starches in the celery root (or potato) into sugars, yielding a sweeter and smoother end result. Put through a whipping siphon and served warm it's a twist on the best mashed potatoes you've ever had. For 4 servings (you will have extra mousseline). Prepare the smoked celery root mousseline (up to 24h in advance): Combine the wood chips and milk in a pot. Bring to a boil then reduce heat and simmer for 20m. Strain; discard the wood chips. Peel and slice the celery root. Combine the celery root and milk in a pot; bring to a boil, reduce heat to a simmer, and cook until fork tender, about 15m. In a separate pan, gently saute the shallot and garlic with a bit of oil until translucent, ~4m. Strain the celery root; discard the milk. Blend the celery root with the shallot, garlic, champagne vinegar, and chicken stock. Weigh the mixture and set at 100%; blend in 1% diastatic malt powder and 0.1% xanthan gum. Adjust seasoning. Transfer to ziplock or vacuum bag without sealing. Cook sous vide for 30m at 125F. Increase the temperature of the bath to 167F to halt enzymatic activity; hold at this temperature for 5m. Strain. Chill in an ice bath. Vacuum pack. Chill until needed. To serve: Transfer the mousseline to a pot and heat to ~160F; do not exceed 167F. Transfer to a whipping siphon and charge once with N2O; shake well. Pipe into a serving bowl. Spoon some of the trout roe in the center of the mousse.